I was the guest of Bellville and Austin County on October 13, 2013. 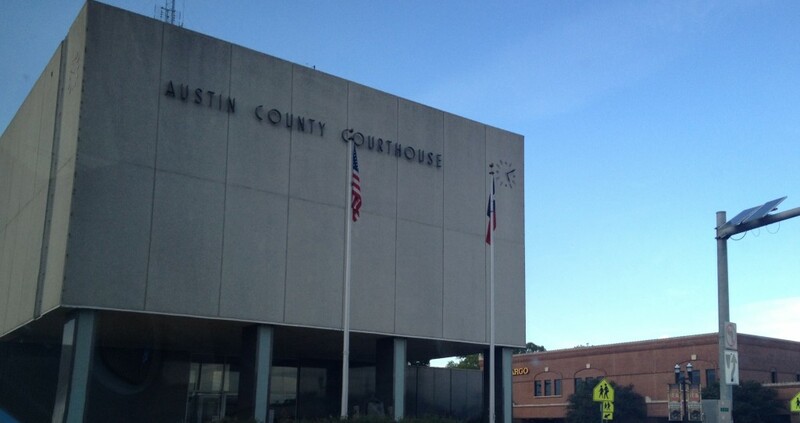 As one of the oldest areas of Anglo settlement in Texas, it should come as no surprise that Austin County’s history bears the records of as many as six different courthouses. 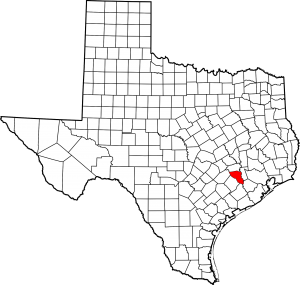 The story begins in 1824, when county namesake Stephen F. Austin founded his settlement of San Felipe de Austin on the Brazos River in what is today southeastern Austin County. On March 30, 1836, at the height of the Texas Revolution, town settlers received news that the Mexican army under President Antonio Lopez de Santa Anna was approaching their community. And so, fleeing in terror, they made the conscious decision to burn the town to prevent the Mexican army from using any of the leftover buildings or supplies. This process of burning communities and fleeing to the east (to America) is known to history as the Runaway Scrape, and many towns other than just San Felipe de Austin took part. Less than a month later, Texas won its independence at the Battle of San Jacinto and on May 14, 1836, President Santa Anna officially signed over the territory to the autonomous control of the Republic of Texas via the Treaties of Velasco. On October 22 of that year, a government was formed under President Sam Houston and the process of establishing the first representative counties began. 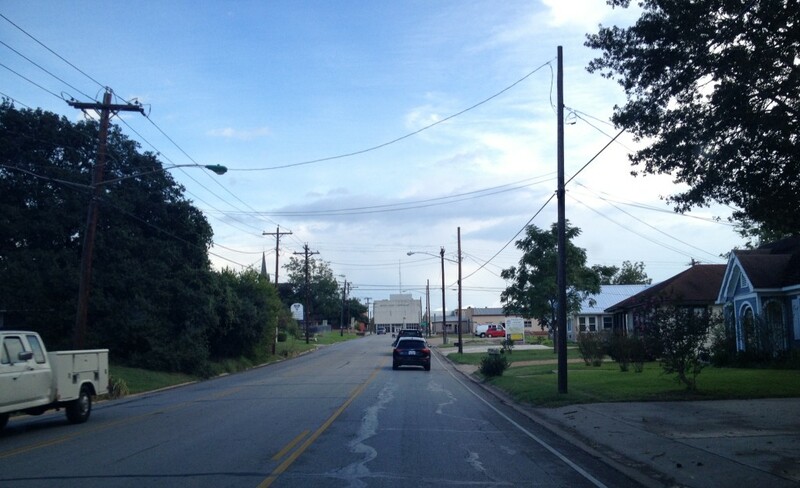 Austin County was organized in 1837, and the old San Felipe settlement was honored by being named the county seat. The town was rebuilt, and part of that process included constructing a courthouse. There are no clear records of what this building looked like or who was responsible for its construction. We just know it existed. 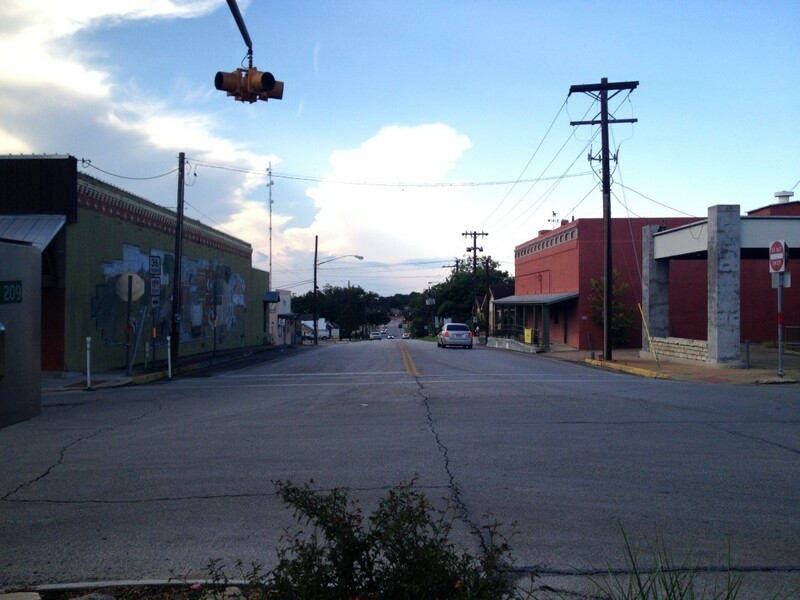 Three years later, San Felipe de Austin was renamed to simply San Felipe and six years after that, a declining population brought about a vote to move the seat of government to the more centrally located Bellville. Bellville was built upon land donated by Thomas B. Bell and his brother James and existed for approximately two years before it was properly plotted and surveyed. That was in 1848. The same year, a log cabin courthouse was constructed by contractor Benjamin L. Cheek and was accepted by county officials on August 26. Two years later, in 1850, Sam Shelburne constructed Austin County’s third courthouse: a one-story, wooden frame building with a shed roofed porch. 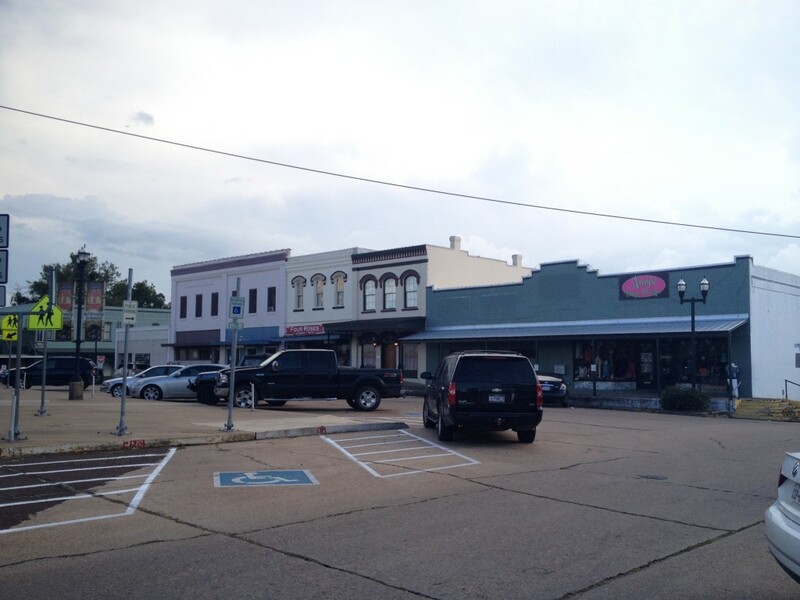 However, by 1855, the area was already clamoring for more space for county business. 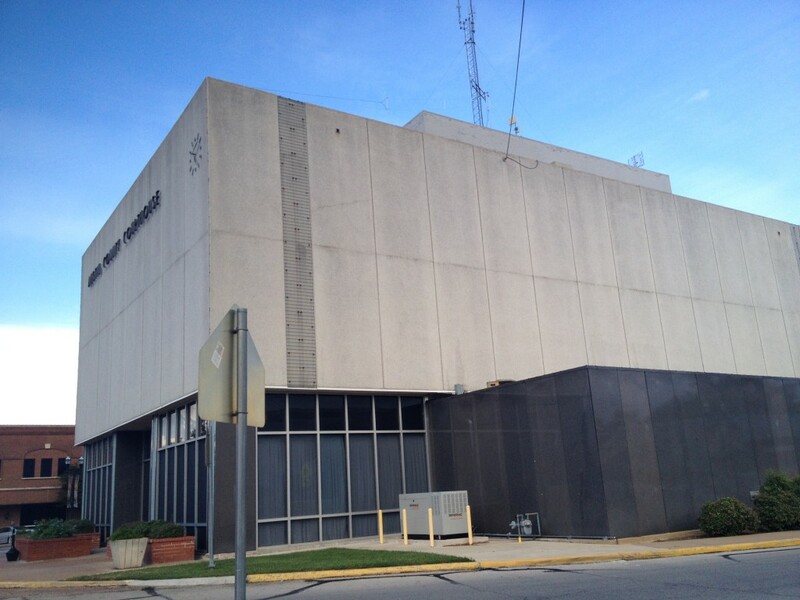 On November 19 of that year, officials authorized the sale of the building at auction. Prior to this, the construction effort of the next courthouse had already been underway due to the leadership of contractor Philip M. Cuny. It was completed on November 20, 1855. An addition was made in 1877 for $2950, but those funds don’t appear to have been well spent. 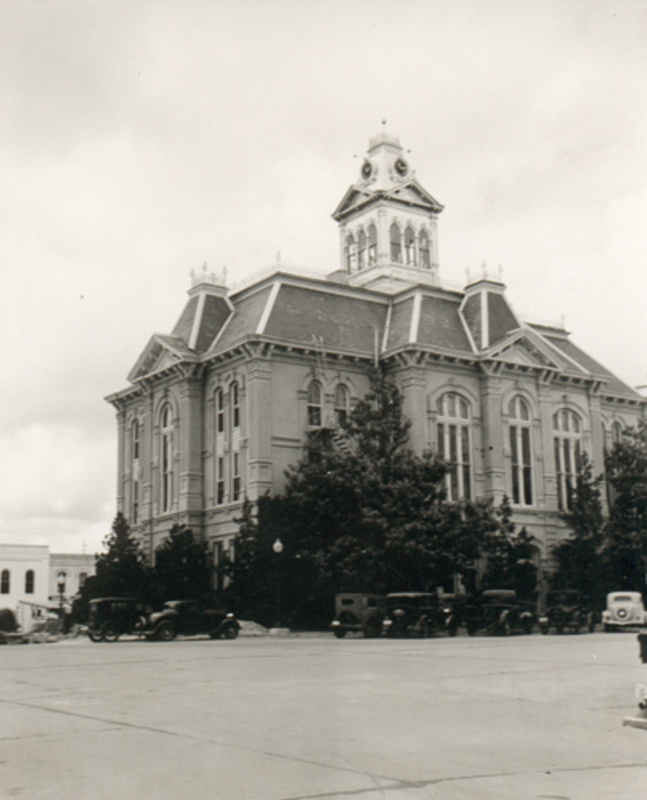 A recorded observation by architect Eugene Heiner while visiting Bellville (likely there because he was surveying the area as he drafted plans for the next courthouse) caught him saying the courthouse looked “liable to fall at almost any moment”. That was September 3, 1884. 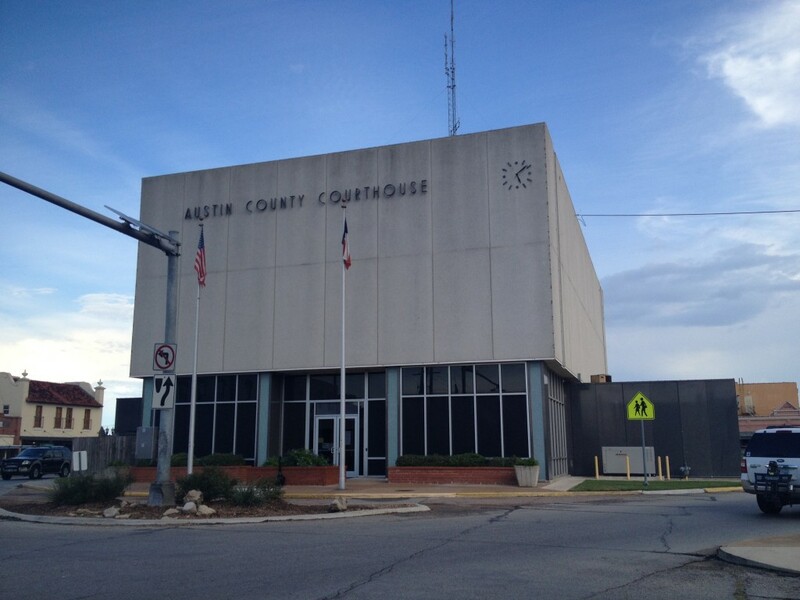 Indeed, this was Eugene Heiner’s work, and the grandest courthouse Austin County has ever seen. Working in tandem with contractor Henry Kane of Gonzales, the two men brought this imposing, brick, Second Empire creation to life. Source vary on whether its cost was $37,500 or $45,000. At any ate, records indicate that Heiner only took home $955.50 of that total. The courthouse was accepted by commissioners on March 25, 1887 and burned seventy three years later in 1960. Wyatt C. Hedrick, one of the most notable Art-Deco and Moderne architects in the entire United States was based principally in Fort Worth. His work was not limited to courthouses, and his career would include some of Texas’ most widely known architectural wonders like the Shamrock Hotel in Houston and the Will Rogers Memorial Coliseum in Fort Worth, however, a significant portion of Texas courthouses can be attributed to him today. 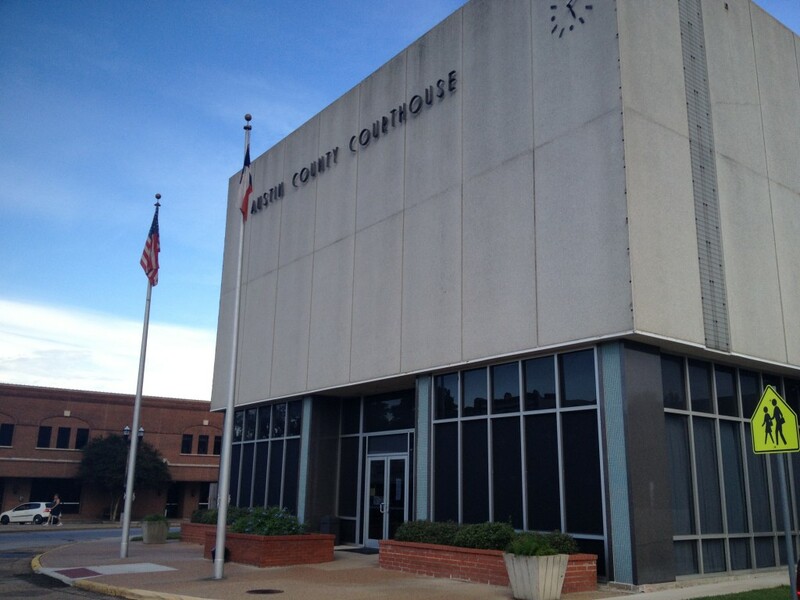 Beginning in the 1920s and concluding in 1960 with the Austin County Courthouse, his lengthy career ended with his death in 1964. This was the final courthouse he designed before then. The courthouse sits in the center of a busy traffic circle, facing slightly northwest towards Main Street.